When I’m coaching a team, I sometimes start with 1:1’s with team members and I’m in a privileged position where the team members will open up to me and be really honest. They will be honest about what they need from other team members, about the things they like and dislike about the team, and will often say incredibly helpful things that would not otherwise be said. When working with the whole team, part of my role is to help them share these truths in a helpful way and make decisions based on them. My experience of doing this is a positive one. The team really benefits from sharing a wide variety of, often pent-up, perspectives, opinions, and feelings and then deciding what to do about them. I’m delighted to help make a positive impact, but a little bit of me worries whether I might be inadvertently disempowering the team, and they’re simply paying me to be there so that they can speak the truth to each other. As part of leadership or team development, I sometimes make use of 360 feedback where I will facilitate the feedback sessions and I often experience that exact same feeling of getting paid to help people speak truth to each other. As a coach, I believe it is essential that I help people to help themselves and I don’t inadvertently disempower people by creating a dependency where they need me to be present in order to speak the truth to each other. Rather than encourage or be complicit in dependency, I wanted to find a way to help people develop their capability to speak truth to each other. Over the space of a few sessions with senior leadership teams across a number of sectors, I started to model what I was hearing in terms of truth. I heard a lot of compassionate truth being spoken; truth being spoken for the good of the other person. Sometimes I heard truth being spoken with a negative intent, to hurt the other person or score points. Quite often, I could see truth being avoided as people skirted around ‘the elephant in the room’ and what needed to be said did not get said. I sketched out the model (shown below) to help me make sense of the conversations I was hearing. The model is simply a 2×3 matrix with one dimension being the intent (positive or negative) and the other dimension being the degree of truth being spoken (speaking truth, avoiding truth, or speaking lies), resulting in six options for classifying what is being said (and what isn’t). I have very deliberately included the option of ‘avoiding truth’ so that this is as much about what is not said as it is about what is said. I’ve written about this before, but wanted to add more detail about my experience of applying this model. As a model, it helped me make sense of the conversations and I was curious as to how I could use this to help clients help themselves and develop their capability in this area. I see a real strength in helping people notice something, make sense of it, and then make an informed choice based on this new awareness. I started to introduce the model into team coaching sessions in order to help teams notice and make sense of something that might otherwise go unnoticed. ‘Speaking the truth’ isn’t the opposite of ‘being nice’. Rather, not speaking the truth can be the opposite of ‘being nice’. It is easier to give regular and timely feedback rather than get frustrated and save it up to the point of expressing it badly. Giving somebody ‘the silent treatment’ as a replacement for feedback isn’t very effective. Performance management/review processes are sometimes really bad examples of truth, with lots of important things not being said. Truth is incredibly powerful, but we need to remember that there are very few absolute truths and most truths are influenced by a person’s perspective. The so-called feedback sandwich (where you give a compliment, then say what you really want to say, and then close with another compliment) is of no use whatsoever. How we receive feedback sends a huge signal to the person giving the feedback and we each have an obligation to receive feedback well. The things that often go unsaid are the things that can change everything for the better if they can be said well. Leadership teams have a huge opportunity to lead by example in both giving and receiving feedback. After I have facilitated the team through the initial discussion, I will refer back to it in a number of ways. I will always try to role model good behaviour in speaking the truth with positive intent, and I will encourage the team to notice how they are doing. In 360 feedback sessions, I will sometimes use this model as a basis for helping people make sense of what they have heard and I will encourage them to share their feedback with their ‘raters’ and engage in a discussion about the feedback. This way, 360 feedback can be an opportunity to encourage people to both give and receive feedback, rather than just a one-off process or event. My experience is that the model is helping people to help themselves and is having a sustainable positive impact. There is, though, one huge surprise for me in this whole experience. 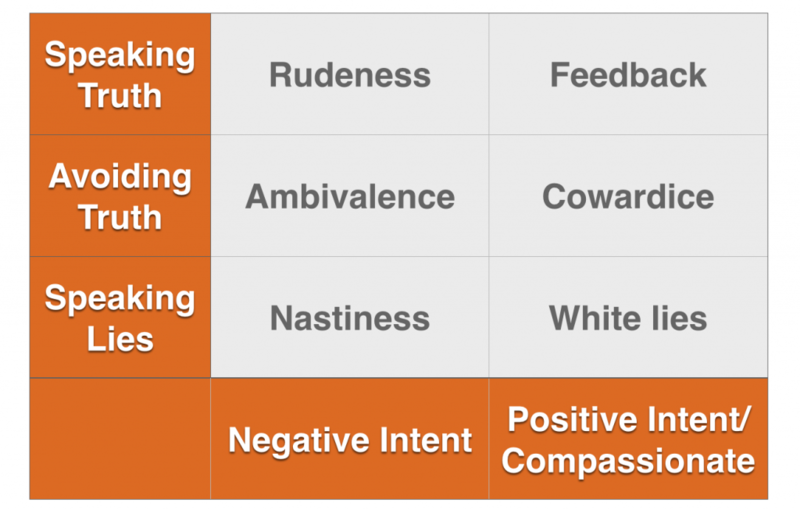 I fully expected the application of this model to help teams say the things that needed to be said and engage in more constructive discussions. That has certainly been the case, but it is only part of a wider truth that often emerges. The things that have been left unsaid are often all about appreciating people. My experience is that teams often realise that they are not ‘catching people doing things right’ as they are busy looking for when people do something wrong, and they’re not providing that specific feedback about what people are doing well. What often goes unsaid is appreciating people for their unique strengths and their contribution. That is a truth that certainly needs speaking more often. For all that we sometimes make feedback really complicated, I think it is based on something really simple; speaking the truth with positive intent. Helping people to help themselves is powerful, and people and teams can easily learn to speak the truth with positive intent for themselves.